Tracy Puckett works fused glass magic, mixing opaque, clear, iridescent and specialty glass to form creative objects that can be both useful and functional. Her studio is in the Las Vegas, Nevada area. While she is known for her bowls, plates and ornaments, our introductory selection here are her newest items, plant stakes! 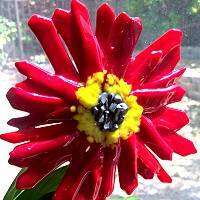 If you are unfamiliar, the fused glass flowers are mounted onto ultra sturdy metal stakes, you can stick them into your house plants to sizzle in the greenery, or outside to brighten up a bare spot. 5 inch flower is made of dozens of clear and iridescent glass pieces, fused together to form a unique shape. The color range is amber orange-yellow and soft brown. 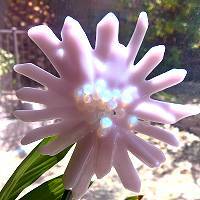 Flower is mounted in back to 6mm sturdy 12" metal stake, total height 13 inches. Ideal for potted plant accent, that will catch the sun or be colorful all on its own. 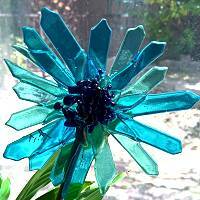 4-1/2 inch flower is made of dozens of clear and iridescent glass pieces, fused together to form a unique shape. The clear colors come to life in the sunlight. Flower is mounted in back to 6mm sturdy 12" metal stake, total height 13 inches. Ideal for potted plant accent, that will catch the sun or be colorful all on its own. 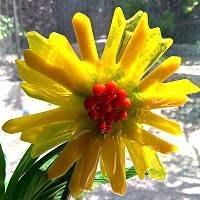 4-1/2 inch flower is made of dozens of opaque and translucent glass pieces, fused together to form a unique shape. The color range is soft petal pink with pearly white center. Flower is mounted in back to 6mm sturdy 12" metal stake, total height 13 inches. Ideal for potted plant accent, that will catch the sun or be colorful all on its own. 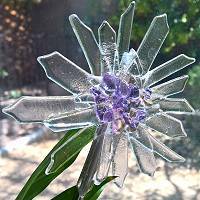 5 inch flower is made of dozens of clear and opaque glass pieces, fused together to form a unique shape. The color range is rich dandelion yellow with lime and red center. Flower is mounted in back to 6mm sturdy 12" metal stake, total height 13 inches. Ideal for potted plant accent, that will catch the sun or be colorful all on its own. 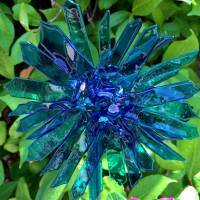 5 inch flower is made of dozens of clear and iridescent glass pieces, fused together to form a unique shape. The color range is teal blue, aqua and iridescent indigo center. Flower is mounted in back to 6mm sturdy 12" metal stake, total height 13 inches. Ideal for potted plant accent, that will catch the sun or be colorful all on its own. 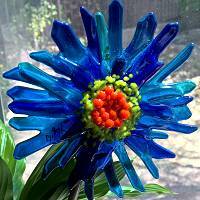 5-1/2 inch flower is made of dozens of clear and opaque glass pieces, fused together to form a unique shape. The color range is cobalt blue with yellow and red-orange center. Flower is mounted in back to 6mm sturdy 12" metal stake, total height 13 inches. Ideal for potted plant accent, that will catch the sun or be colorful all on its own. 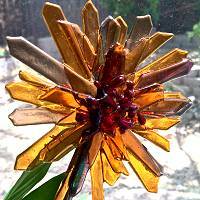 5 inch flower is made of dozens of opaque glass pieces, fused together to form a unique shape. The color range is rich tomato and brick reds with sunny yellow and charcoal center. Flower is mounted in back to 6mm sturdy 12" metal stake, total height 13 inches. Ideal for potted plant accent, that will catch the sun or be colorful all on its own. 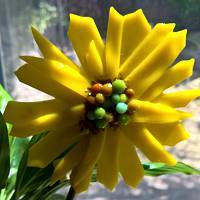 4-1/2 inch flower is made of dozens of opaque glass pieces, fused together to form a unique shape. The color range is true sunshine yellows with earthy greens at center. Flower is mounted in back to 6mm sturdy 12" metal stake, total height 13 inches. Ideal for potted plant accent, that will catch the sun or be colorful all on its own. 5 inch flower is made of dozens of transparent and iridescent glass pieces, fused together to form a unique shape. The color range is royal blue and turquoise/teal. Flower is mounted in back to 6mm sturdy 12" metal stake, total height 13 inches. Ideal for potted plant accent, that will catch the sun or be colorful all on its own. Read about what others think of Tracy Puckett's fused glass art! Instead of reviews for a specific product, this is a place to share about the designer line in general.